Seventy-year-old Anil Chandra Mahanta in Bangladesh’s Rangpur district can’t remember how long he has been cultivating brinjals in his small farm. “That is a way of life for a Bangladeshi,” he says in a matter-of-fact way. But since January this year, his brinjal farm is bringing him unusual attention, and also concerns. The 0.12 hectare of farm behind his tin-roofed house is turning out to be a battlefield. Bangladesh became the first country in South Asia to cultivate a genetically modified (GM) vegetable when it allowed Bt brinjal in January. And Mahanta is one of the 20 farmers selected by the government for the cultivation. “Like in the past years, even this time I have taken up brinjal cultivation. But everybody says it is different. Do you know why?” he asks. All he knows is that his small farm is up for a “big” experiment. The prime minister of the country is talking about it, he emphasises. “I know many people are fighting over this new brinjal. But I have faith in the officials of the nearby agriculture research centre,” he says, looking at an agriculture scientist visiting his field for supervision. Mahanta’s backyard farm looks no different from any other farm in the neighbourhood. The Bt brinjal plants have been sown in neat rows surrounded by a row of other plants. “I don’t know why this has been done. The officer suggested me,” says Mahanta. A crop of cauliflower is almost encroaching on the brinjal patch. He scares away a flock of birds from the brinjal saplings, not watered for a week. “You should water them regularly. They are almost dead,” warns Abusalim Mohammad, the scientific officer with the Bangladesh Agriculture Research Institute (BARI), who is designated to monitor the first crop of Bt brinjals. “But my earlier crops did not need so much water,” Mahanta resists. For almost all the suggestions Mohammad makes, Mahanta counters with his traditional knowledge of brinjals. But there are differences he may not be aware of. Does Mahanta know what a Bt brinjal is? “Future will tell what it is,” he says. But he is getting impatient with every passing day. And not without reasons. Brinjal is grown round the year in the country. In terms of acreage and production, it is the second most important vegetable after potato. Brinjal is an important source of income for small-scale farmers like Mahanta. “I get 30-40 per cent of my earning from brinjal cultivation,” he says. There is also cultural fascination for this prolific vegetable. Brinjal is believed to have originated in Bangladesh, which has around 100 varieties of the vegetable. On October 28, 2013, Bangladesh’s National Committee on Bio-safety (NBC) approved the cultivation of four GM varieties of brinjal—Kajla, Uttara, Nayantara and ISD006. These have a gene from Bacillus thuringiensis (Bt) bacteria that makes them resistant to fruit and shoot borer (FSB) pest, which is common in South and Southeast Asia. The Bt protein in the brinjal disrupts the digestive system of FSB pests, causing them to die within three days of ingestion. The four varieties also carry the Cry1Ac protein gene, which has been provided by India-based Mahyco (Maharashtra Hybrid Seed Company) and trans-national Monsanto under the Agricultural Biotechnology Support Project (ABSP). The US Agency for International Development is funding the project. India imposed an indefinite moratorium on the cultivation of Bt brinjals developed by Mahyco, in February 2010 after protests. The Philippines has also halted trials on Bt brinjal since 2011 over health and safety concerns. In January this year, the Bangladesh government distributed seeds and saplings of Bt brinjals to 20 farmers from four different agro-climatic zones (Jamalpur, Pabna, Rangpur, and Gajipur) for cultivation. The four zones have high FSB infestation. Mahanta, who believes FSB pests are a problem, says there are organic ways to tackle the pest. Some eight years ago, scientists from BARI had taught him ways to tackle the pest through integrated-pest management. “That worked,” he remembers. “Only after the first crop is harvested, will we be able to do a cost-benefit analysis,” Manaaf says; agreeing with Mahanta’s constant reference to “future” . This uncertainty haunts the country’s farmers associations and environmentalists. Immediately after agriculture minister Matia Chowdhury distributed the seeds during a public function on January 22, protests followed. On March 13, farmers formed a human chain around the deputy commissioner’s office in Gazipur to protest against Bt brinjal. They also took an oath not to cultivate GM crops and decided to ask the farmers already using GM crops to join the boycott. A week earlier, Rangpur had also witnessed similar protests. Farida Akhter, a social activist responsible for the establishment of community seed banks in the country, says, as the vegetable is largely cross-pollinated, transgenic contamination poses a big problem in protecting the natural biodiversity as well as local varieties of brinjal. The Cartagena Protocol on Bio-safety recognises the importance of protecting centres of origin and centres of genetic diversity. More than this, she says, the government has hurried the approval without considering the impact. To begin with, Bangladesh does not have a bio-safety law to regulate commercial cultivation of GM crops or organisms. On the sensitive issue of its long-term impact on health and genetic contamination, no study has been done in the country. The government gave its nod on the basis of a three-month sub-acute toxicity test on some different cultivable Bt Brinjal varieties developed in India, which was conducted by Mahyco, the sub-licensor of the technology. The test says nothing about the four different cultivable varieties developed in Bangladesh. Ask Mahanta about the precautions he has been asked to take before planting the Bt brinjal saplings and he says, “Nothing.” “We have to meet seven conditions before we get the approval. I observe and maintain all the conditions,” Mohammad says. One of them is: “The farmers will have to be trained on environment-friendly cultivation and on bio-safety. Also, farmers should be provided with a manual on bio-safety and Bt brinjal cultivation.” He dismisses the fear that the transgenic crop can contaminate nearby crops. Mahanta says the government did not seek a formal consent from him. “I have an economy to manage and scientists have the technology,” he says, explaining why he opted for Bt brinjal. The government’s decision not to consult the farmers has irked many. The Bangladesh Fruits, Vegetables and Allied Products Exporters Association protested it, saying that the government did not consult them before releasing the GM varieties. Even the European Union has cautioned the Bangladesh government that the decision would have an impact on the export of vegetables from the country. “Why was such a controversial step taken by the government suddenly without consulting the people or the scientists of the country? This is still a mystery to all of us,” says Mohidul Hoque Khan of Bangladesh Poribesh Andolon. As Bt brinjal plants take roots in Mahanta’s farm, he is worried about the economy of the new variety. 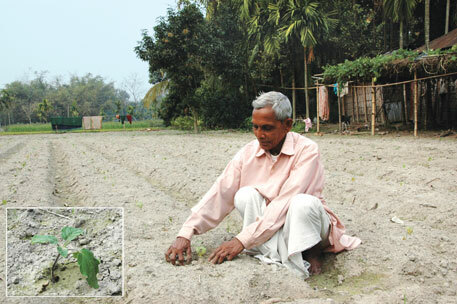 Unlike in the past, this time the government gave him the seeds along with 600 Bangladesh taka to fix his farm. That is a small incentive. He earns around 4,000 Bangladesh taka from one crop of brinjal. “I have seeds from my earlier brinjal crops. But people say I may not get the seeds from this crop,” he says, expressing a fear most of the country’s experts share. Manaaf, reiterating the government’s stand, assures that farmers will have ownership over the Bt brinjal they cultivate. However, details of the contract between the government and with the private players show something different. The tripartite agreement signed by Mahyco, Sathguru Management Consultants Private Ltd (India) and BARI in 2005 for the development and release of cultivable Bt brinjal varieties in Bangladesh clearly states that Monsanto or Mahyco preserve all the intellectual property rights of the technology. Sub-section (c) of Section 9.2 of the deal notes that it can be terminated by the sub-licensor if the laws and regulations in Bangladesh do not provide assurance of protection for commercial and intellectual property rights. By April end, the first harvest of Bt brinjal will be ready, and so will be the first consumers of the transgenic food crop in South Asia. The fear of genetic contamination has crossed the national border of Bangladesh. The cultivation areas are close to the border with India that has an official moratorium on Bt brinjal. 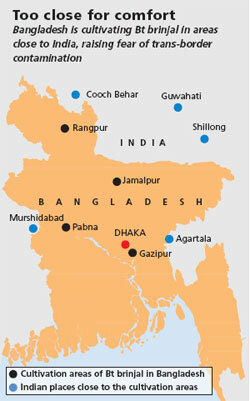 “The borders between Bangladesh and India is not impermeable and seeds are traded illegally between the two countries. Birds, insects, rivers and wind could also cause gene contamination sooner or later,” says Tushar Chakraborty, molecular biologist at the CSIR-Indian Institute of Chemical Biology, Kolkata. Mahanta and his neighbours agree that there is cross-border business on vegetables and other crops. One of them brings out a packet of hybrid brinjal seeds procured from West Bengal in India. But do they know it is illegal and potentially dangerous to send Bt brinjal seeds across the border? They look at each other and then at Manaaf. “We will monitor it,” he says.